Claret is the liquor for boys, port for men; but he who aspires to be a hero must drink brandy. Said Samuel Johnson.. and he should know! 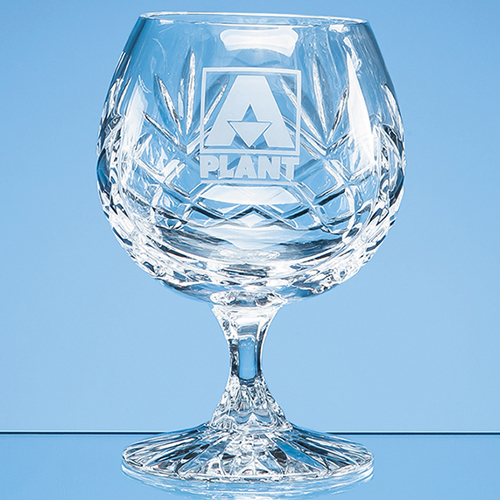 This elegant, long stemmed 280ml Glencoe lead crystal brandy glass is beautifully cut in a classic diamond and wedge pattern leaving a panel to engrave a message, logo or crest. Its the perfect corporate gift or award or a personal memento to mark a special occasion such as a retirement, anniversary, wedding or birthday. Available as an option is a beautiful presentation box with blue satin lining.